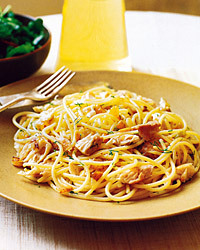 Variation Spaghetti with Sardines and Pine Nuts: In place of the mackerel, add two 3 1/2-ounce cans of boneless, skinless sardine fillets, drained, to the pan for the last 2 minutes of cooking. Break the fillets into flakes with a spoon. The full-force flavors of this dishfrom the sweet raisins and strong mackerel to the dillneed to be paired with a full-flavored, acidic white wine. Try a Sauvignon Blanc from northern Italy or New Zealand.